This knitting project is knit with worsted yarn on US size 8 (5mm) circular needle and is a free download, available in Danish, French, Italian, Icelandic, Mandarin, Swedish, Spanish, and English. 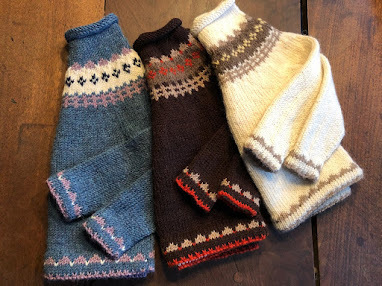 Wynne has provided ample knitting help links, should you need assistance with the buttonholes or knitting from the yoke down for the first time. 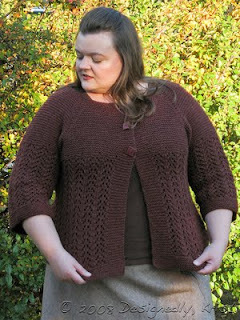 The pretty red "Lady Sweater" is by fiberitis on Ravelry. Just love the colorway! 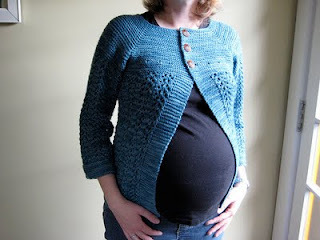 It's the perfect cardigan for the cool fall days just before that new baby comes along and is shown here by Bridgid of Pasadena, CA. 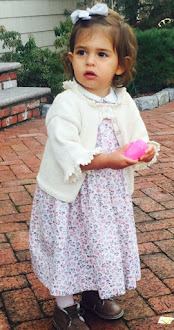 Find the free pattern download link for personal use only on Ravelry. Another option is young Scottish knitting phenom, Ysolda Teague's, new book, Little Red in the City, with size range in patterns from 28 in to 60 in. There are literally 15-17 sizes included for each pattern. Check out Little Red in the City. Absolutely gorgeous. Very tempted to knit this once I've finished the numerous other projects I've promised my daughter I'll knit for my granddaughter.